As many car enthusiasts know, the Fiat 124 Spider Abarth was sampled by the media earlier this month. Those invited were given the opportunity to flog the car around a long autocross track that highlighted the nimbleness and just some of the performance capability of the car. It is safe to say that all left with huge grins on their face, but also may have left with a misconception about the engine's performance. 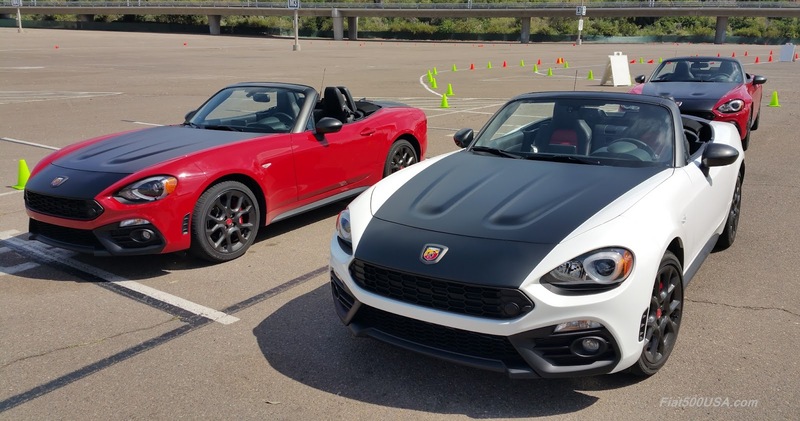 The Fiat 124 Spider Abarth makes 164 hp, up four hp more than the standard 124 spider's 160 hp. This horsepower increase is mainly attributed to the Abarth's signature free flow exhaust system. Most people think that's the only difference between the standard car and the Abarth, but there is more there than meets the eye. The 124 Spider Abarth has a Sport button that activates a unique engine tune that changes the torque delivery of the car compared to the standard Spiders. These changes were not reflected in the preliminary specs that list all models having 184 lb-ft of torque at 2500 rpm. While the output is correct, the engine speed this happens at needs to be clarified. Specs for any models not in Sport mode (including Classica and Lusso, which don't have a Sport mode) is 184 lb.-ft. at 3200 rpm, while the Abarth in Sport mode is 184 lb.-ft. at 2500 rpm. Comparing the 124 Abarth in Sport mode to the standard cars, at 2500 rpm the Abarth makes 184 lb.-ft. of torque compared to 170 lb.-ft. at the same rpm for the standard car. Along with the extra low-end torque, Sport mode gives you more aggressive throttle response which helps you power out of corners and turns quicker. Shift calibrations for automatic transmission cars are also changed, with gears held longer, and shifts made quicker. Steering calibrations have more feel dialed in, and dynamic stability control settings are tweaked for more throttle-steer. Fiat will be updating the specification on the 124 Spider shortly, so consider yourself the first to know!